Hazen’s brigade arrives at Snodgrass Hill. 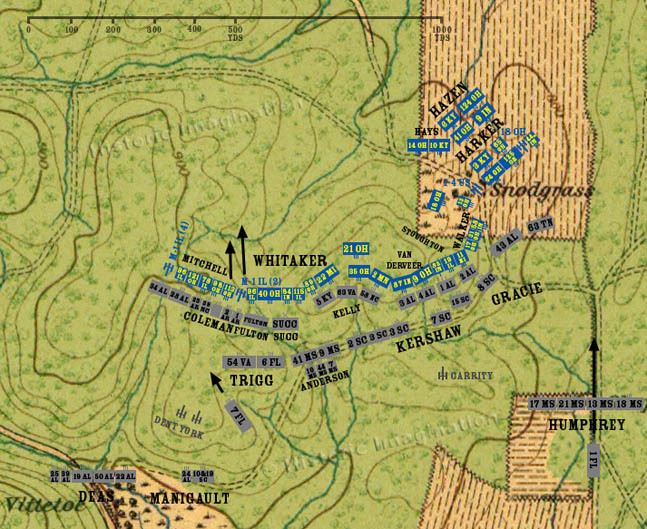 The regiments of the brigade form behind Harker and alternate front line positions with each other. The limitations of the map give a false impression of the depth of the formation. In truth, the two brigades were right behind each other on the reverse slope, likely in a formation only 50 yards deep. The slow, steady pressure from Johnson’s Division takes its toll on Steedman’s forces on Horseshoe Ridge. Both sides are exhausted. The 113th Ohio and the adjacent section of Battery M, 1st Illinois leave the front line and fall back.